Dieter Hackfort is a Full Professor for Sport Psychology in the Faculty for Human Sciences at the University FAF Munich. In 1986 he was a visiting professor at the Center for Behavioral Medicine and Health Psychology at the University of South Florida. From 1991 to 2004 he was the Head of the Institute for Sport Science at the University FAF in Munich. From 2004 to 2009 Dr. Hackfort holds the position as the founding Dean of Aspire the Academy for Sports Excellence in Doha, Qatar. From 2009 to 2010 he served as a founding Director of the Sport Science Program at Qatar University. He has served as a counselor for professional performers and athletes of various sports at the Olympic Centers in Germany. His research has been published in 28 books and edited volumes, and in more than 150 contributions in national and international journals. From 1996 to 2008 he served as an Editor-in-Chief for the International Journal of Sport and Exercise Psychology. He headed projects in Quality Management and successfully managed ISO 9000 and EFQM certifications in educational and sports organizations in Germany and Qatar. From 2005 to 2009 Dr. Hackfort served as the President of the International Society of Sport Psychology (ISSP). He was awarded for his outstanding research and leadership, e.g., in 1984 from the German Sports Federation: Carl-Diem Plakette for his research, 2001 he received the Honor Award of the International Society of Sport Psychology (ISSP) in recognition of significant contributions to national and international sport psychology through leadership, research, and personal service. 1999 he was appointed Honor Professor of Wuhan Institute of Physical Education, China, in 2017 he received The ISSP International Sport Psychologist Award, and in 2018 the ISSP conferred to him the Fellow status. Dieter has consulted extensively in, e.g., Tennis, Golf, Car (Formula One, GT, Ralleigh) Racing since more than two decades. Robert J. Schinke is the Canada Research Chair in Multicultural Sport and Physical Activity and a Professor of Sport Psychology in the School of Human Kinetics at Laurentian University in Canada. In this capacity, he is an internationally sought after scholar in the thematic area of cultural sport psychology. As a Canadian Sport Psychology Association accredited practitioner, Schinke has extensive experience working with Olympic teams and professional athletes of North America, South America, Europe, Asia, Africa, and the Caribbean. Robert has authored more than 120 refereed publications and co-edited fifteen textbooks, including the Routledge International Handbook of Sport Psychology. His research is supported by the Social Sciences and Humanities Research Council of Canada and the Canadian Foundation for Innovation. In addition, Robert serves as the co-editor for the International Journal of Sport and Exercise Psychology and he is also an associate editor for Case Studies in Sport and Exercise Psychology. 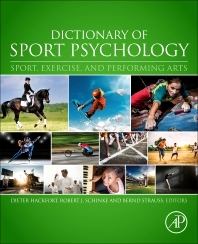 He has also guest edited the following journals: International Journal of Sport and Exercise Psychology, Journal of Sport and Social Issues, Journal of Clinical Sport Psychology, Qualitative Research in Sport, Exercise and Health, Psychology of Sport and Exercise, and the Journal of Sport Psychology in Action. Robert is also the current Past-President of the Association for Applied Sport Psychology and serves at present as President of the International Society of Sport Psychology. He, his wife Erin, and their two sons, Harrison and Pierce, reside in Sudbury, Ontario. Bernd Strauss, born 1959, is currently Full Professor for Sport Psychology at the University of Muenster, Germany (since 1998). He obtained his PhD from the University of Kiel (Germany) in 1992 with a thesis about complex problem solving. He had been the former president of the German Society of Sport Sciences (2003-2009). Currently he is president of the German Sport Psychology association. Bernd Strauss published more than 20 books, and more than 70 peer-reviewed papers. Currently he is Editor-in-chief (in collaboration with Nikos Ntoumanis, AUS) of the Journal “Psychology of Sport and Exercise” published by Elsevier. His main research interests are focused on expertise in sports (perception, attention, laterality), social psychology (self concept, influence of audiences on performances, sports spectators) and research methodology.